Geoffrey William Wilson was born in Norfolk in 1920. Working from 1953 following contact with near neighbour, Sir John Arnesby Brown RA, he studied under and worked closely with marine artist, Rowland Fisher ROI, RSMA from 1956 to 1963 and was also much helped by Anna Airy, ROI, RE during the latter part of that period. 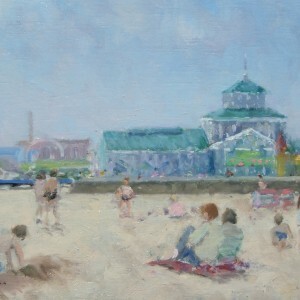 Geoffrey Wilson had exhibited at the Royal Academy, the Paris Salon, The Royal Institute of Oil Painters for over twenty years to 1979 (some fifty works) and, on sending, to the Royal British Artists and the Royal Society of Marine Artists. His work was also shown in the travelling exhibitions of the Art Bureau. He had major one-man exhibitions at Great Yarmouth in 1962/3, Scunthorpe 1964 and at Lincoln in 1967 having moved to Lincolnshire in 1963. He had shared exhibitions in York in 1979 and 1980. 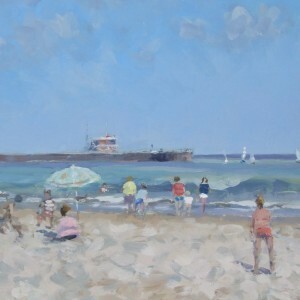 He retired as a Chartered Surveyor to Norfolk in January 1983 to paint full-time, working extensively in East Anglia and Dorset as well as abroad – mainly in France and Italy. During this period Geoffrey had exhibitions in Windsor, Lavenham, London, Bournemouth and in Norfolk. Also a shared exhibition at East Bergholt in 1999. He was a Past President of the “Lincolnshire Artists’ Society” and a past member of the “Great Yarmouth and District Society of Artists”. Geoffrey Wilson died in the summer of 2010 aged 90.